Announcement I have been hanging out in South Texas this winter working all the area craft shows at the 55+ mobile home parks. It has been such fun. I've met more people from Minnesota then I do when I am in Minnesota. Glad to be back on Etsy at last. I will be adding new pieces over the next couple weeks and onward. I'm excited to get back to my lake lands up north. Soon!! I have been hanging out in South Texas this winter working all the area craft shows at the 55+ mobile home parks. It has been such fun. I've met more people from Minnesota then I do when I am in Minnesota. Glad to be back on Etsy at last. I will be adding new pieces over the next couple weeks and onward. I'm excited to get back to my lake lands up north. Soon!! Pebble Art / How Do I Love You? So fun! So sweet. Bought as a gift, but couldn't part with it. Love Love it. Shipping was speedy and great communication. Picking up pebbles and sorting them is almost as fun as making Pebble Art. I could sit for hours. This summer we built me a brand new "tiny studio." It is warm and I've totally owned it now. Love it. My husband and I built a sweet little straw bale house on 20 acres in northern MN. Love my spot of earth! Here is my guy, Milt Lee. We have had so many adventures in the nearly 30 years we have been together. Soul mates. I just deactivated all of my items because of several upcoming shows. My pebble art has been flying out the door, and I need to catch a breath and allow time for new pieces. Please return soon and I'll have new pieces up. I grew up in northern Minnesota and spent most every summer on one of our 10,000 lakes. I've always loved the beach--pebbles, shells, seaweed. Whenever we have traveled I've always brought home a few pebbles or small stones in my pocket or luggage. Once when I was barely out of high school I made a first trip to the southwest and brought home a suitcase full of petrified wood. When my sister picked me up she grabbed my suitcase and said, "What the heck do you have in here? Rocks? Yes, that's right. Most of my professional life I've been a speaker, writer, trainer, and teacher. I've only had one goal--to help people reach a little higher and have a bit more clarity. I've been in front of the room with thousands of people over the years and worked with trauma, dis-function, pain. I've used writing and crafts to help me deal with this world and its many problems. This year (2017) I turned 64. I didn't choose it consciously, but I've slowly moved away from "helping others" and into my own interior world. I began playing with drilling rocks and continuing to play with beads and The Bead People project. One day I stumbled on several pebble art pictures and fell instantly in love with these tiny bits of artistry. I took some watercolor paper I had and spread out a bunch of pebbles and began playing with my own pebble stories. Wow. I had no idea how addictive this could be. I'm continually fascinated about how the micro movements of tiny pebbles over a tiny space can create story and personality. I'm so happy to have found this form of expression. Also, sitting on beaches is one of my favorite pastimes. I live in Cass Lake, MN on the Leech Lake Reservation. We have several large and sacred bodies of water on all sides of me. Most of my pebbles are coming from Leech Lake, Cass Lake, and of course my frequent visits to Lake Superior. Whenever we go back to Rapid City, SD I have a favorite spot along Rapid Creek that has the craziest spikey rocks. I love them! My grandkids even helped me gather them last time. 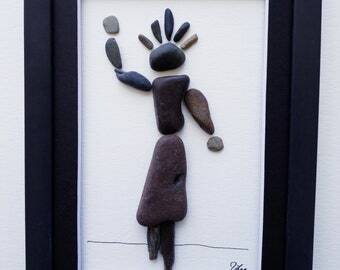 I set up at a number of craft fairs last summer and loved watching people react to my pebble art. Over and over again a person would look at a piece and instantly begin to attach their own meaning and story to it. Somebody suggested I add little captions or saying but, honestly, it is much better to let another person infuse a piece of work with their own story and meaning. So, I'm happy that you have joined me on this new journey. I'm entering my "forest years" and feel empowered to play and work with whatever my own soul demands. I hope you do the same. Creating is a special energy and life-giving force that makes the world go round. In the recent months, people have begun asking me to create a special pebble art picture for them. This has been great fun. What I do to take the pressure off is agree to create 3 pictures relating to their request and they pick the one they like. For example, a customer wanted to give a give to a special family member who was a vocalist. I had a lot of fun creating "notes" emerging from the young woman's being. So do ask if you need something special for somebody special. I'm not a media wiz so if you like my site, please invite your friends to visit. I hope to share my work with lots and lots of people without having to do endless craft fairs! After a life of serious inquiry into human development and a changing world, I'm taking time out to play. And I've chosen to play with things found in the natural world. I'm loving it.